Which Bluehost Shared Hosting Is Right For YOU [2018 Edition]? Home » Bluehost » Which Bluehost Shared Hosting Plan Should I Go For? Which Bluehost Shared Hosting Plan Should I Go For? If you are confused about choosing the right hosting plan from Bluehost this page is specially created for you where we’re going to discuss which Bluehost shared hosting plan is perfect for your needs. When it comes to building a profitable online business or a blog, web hosting plays a crucial role. Not only it affects your website speed but also your search rankings. Bluehost is the most reliable hosting option for millions of bloggers worldwide. There are currently hosting over 2 million domains on their servers. Bluehost is the most popular web hosting company owned by Endurance International Group. It is one of the top 10 biggest companies in hosting world. IT was launched in 1996 and offering great hosting solutions to millions of users since then. But there are few questions that often stuck most bloggers to choose the right hosting option for their WordPress sites. If you have a WordPress site and struggling to find the best Bluehost shared hosting plan, this page will help you. Let’s now discuss which Bluehost shared hosting plan is best for you without much ado. 1 Which is the best Bluehost shared hosting plan for WordPress users? 5 How good is Bluehost uptime? 6 How secure is Bluehost shared hosting environment? 7 How easy is it to use Bluehost control panel? 8 What about the customer support from Bluehost? Which is the best Bluehost shared hosting plan for WordPress users? Shared host web hosting is the widely used option for a lot of bloggers. It is the best way to get a reliable hosting with good resources at a limited budget. If you have a limited amount to spend or don’t want to invest if you are a beginner, you can start using shared web hosting. It’s the right option that is more than enough for majority of the WordPress sites. There are a lot of people who are confused about shared hosting and VPS hosting. To put it simply, you will share your resources (CPU time, Speed, Memory, Databases etc) with other people in shared hosting. In VPS hosting, you will get access to dedicated servers where you don’t share your resources with anyone else. VPS hosting costs you more than shared hosting. And is best suitable if you have a high traffic websites which gets more than 100,000 visitors every month. Enough for majority of the WordPress users. Lots of incredible features when you go with reliable hosting like Bluehost. Disk space is also limited. These are all limited because shared hosting servers have to share their memory, space and bandwidth with all the other available resources. Here’s how the Bluehost control panel looks like. Each of these hosting package offers various features that are suitable for wide range of bloggers. So make sure to have a look at their features before picking one among them. Pro tip: I highly recommend you to choose Plus package from Bluehost shared hosting packages as it not is not only cost effective but you can host unlimited number of sites without paying Bluehost anything extra. You will also get a free domain name with all their hosting packages. Now, let’s discuss about the Bluehost shared hosting plan features and decide by yourself which suites best for your WordPress site needs. Basic plan costs you just $2.95 per month. This is the cheap shared hosting plan you can avail from Bluehost. Features of Basic shared hosting plan from Bluehost. This is PERFECT for the beginners who are on a limited budget and wants to host only one website. Plus package costs you $5.45 per month and you can host up to 10 sites without paying them anything extra. Features that you will get with Plus hosting plan from Bluehost. Is this shared hosting plan RIGHT for you? This is perfect for those who are beginners and who wants to continue their online marketing efforts even in the long run. Just by paying few more extra bucks, you can host up to 10 websites. Business Pro plan costs you $13.95 per month. This gives you unlimited access to everything such as hosting space, transferring files, parking domains, managing email accounts etc. Here are the features of Business Pro offered by Bluehost. If you’re wondering about what shared hosting is all about and how does it actually work, let us explain about it in simple terms. In shared hosting environment, multiple users will share the resources of a secured servers in order to run their websites. Shared hosting has two biggest benefits: it’s extremely affordable (as multiple users using the same servers) and packed with powerful features. That being said, shared hosting is the cheapest option for web hosting. Let’s now talk about Bluehost shared hosting along with its features, pros and cons along with pricing. How good is Bluehost uptime? When it comes to picking a good hosting choice, uptime plays a key role. If your web hosting service is giving you 100% uptime which means your site will be running all the time without any hiccups from server side. Uptime can be simply defined as the amount of time your website is online and accessible to the public. Ideally you want this uptime rate as close to 100% as possible since you don’t want to lose your website visitors and sales even for a minute, right? But there are very very few hosting sites that offer you 100% uptime and Bluehost offers you 99.99% uptime guarantee. The best part about using Bluehost is that it promises you 99.99% uptime guarantee and most people don’t know that Bluehost makes sure to fix their downtime issues if they happen anyhow. Most of the system or hardware failure issues are resolved in approximately 15 minutes or even less. Here’s the screenshot of Bluehost uptime. 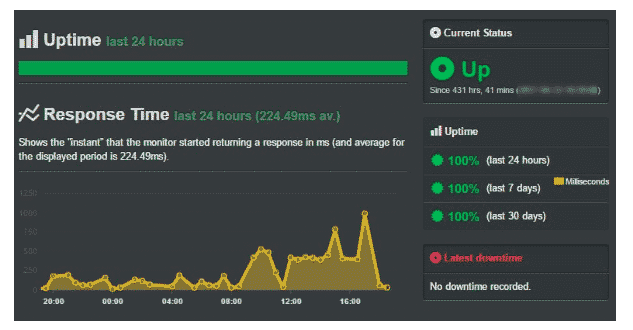 You can see that while performing the result of uptime on Bluehost, it resulted in 100% of uptime (which can be shown from the above image) during last 30 days. So you don’t have to really worry much about facing downtime issues with your websites when you’re hosted on Bluehost shared hosting environment. Just in case if you want to know the status of your website (in case of downtime), you can immediately get in touch with their customer support through phone, email or live chat to immediately get an idea about when your site will be back again. Network monitoring allows web hosting providers like Bluehost to constantly monitor your server and network in order to keep it stable, up and running. If in any case, your network is down, Bluehost fixes it in less than 15 minutes most of the time. Did we forget to tell you that Bluehost offers you 24/7 Network Monitoring to help you keep your site available all the time. How secure is Bluehost shared hosting environment? If I had to start a blog from scratch, I would definitely give security the #1 reason while picking any web hosting choice. Since I had so many bad security instances with few of my sites, it’s a top priority for me. That being said, Bluehost offers you excellent security features to safeguard your site from hackers and here’s a list of few of them. The best part about using Bluehost is that it gives you amazing access controls to create unique passwords restricting access to different areas of your Bluehost hosting account. It simply means that, you can easily generate one password for billing and ownership information and another one for cPanel and dedicated server access and you can also create a master password for the entire account from your Bluehost control panel. SSL (Secure Sockets Layer) is a security protocol which provides the encryption and you can turn your website URL version from http to https version. Bluehost is now offering free SSL certificates with all the shared hosting plans to provide secure, encrypted communications between a website and an internet browser. Are you worrying about your website’s domain privacy. Do you want to safeguard your private information like phone number, your name and address? With Bluehost shared hosting, you can easily prevent identity theft, spam and phishing attacks by hiding the personal information associated with your domain name using a unique feature called “Domain Privacy”. SiteLock is a cloud-based security service that scans your website thoroughly for malware and vulnerabilities so you can instantly fix and act upon your website security threats. Bluehost offers you free access to SiteLock feature which not only detects security related threats such as malware but can also fixes problems or security risks it encounters on your web hosting space. With SiteLock is being enabled, you can easily prevent all the security threats like DDoS attacks, Backdoor mitigation, Firewall threats, XSS prevention and so on. CodeGuard is another amazing security feature from Bluehost which takes daily backups and saving each as a separate version (duplicate copy of your websites). That way it is so much easier for you to get all your data back in case if you lose your data unfortunately. How easy is it to use Bluehost control panel? The #1 reason to consider Bluehost shared hosting is the control panel also known as interface or dashboard. Bluehost offers you 1-click WordPress installer that allows you to install WordPress on Bluehost servers in under 5 minutes with just a click. The best part about using Bluehost is that it gives you access to so many website scripts. Not only WordPress Bluehost offers you numerous scripts such as Joomla, Drupal etc. Pro tip: If you want to see a live demo, click on this link to see Bluehost demo, and feel the experience of Bluehost control panel. You’ll also get access to tools such as files and domains so you can easily manage the following things from your Bluehost control panel. What about the customer support from Bluehost? When it comes to running a website (especially for the first time), you’ll run into way too many problems and too often you might have so many questions related to your hosting. That’s why you need a customer support who is available to you all around the clock. Apart from the above, you’ll also get access to Bluehost knowledge base where you can find a ton of articles and video tutorials around using Bluehost. BlueHost support services are considered as much faster when compared to other hosting companies like HostGator. You can start a live chat on Bluehost and get connected under 5 minutes (whereas you have to wait until 30 to 40 minutes on HostGator). What is the refund policy of Bluehost shared hosting? Bluehost offers you a 30-day no questions asked and money back guarantee if you are not satisfied with their services. That means you can take a free 30 days trial before fully committing your money on any of their shared hosting plans. Here are some of the FAQs you might have in your mind if you are looking to get started with Bluehost shared hosting. #1. Out of all the Bluehost shared hosting plans, which one is the best? If you’re looking for the cheapest shared hosting plan, go for Bluehost Basic plan which costs you just $2.95 per month and it is best for beginners who is also on a tight budget where you can install 1 WordPress site. If you can spend few more dollars, you can go for Prime option (costs you $5.95 per month) but you can install any number of sites. #2. What are the different types of hosting does Bluehost offer? So what are all the hosting plans offered by Bluehost? Bluehost currently offers you the following types of hosting. #3. How does shared hosting on Bluehost work? Usually in shared web hosting servers, large number of websites are being hosted. By large number I mean that it can be even 1000 users on a single shared hosting server. Each user may have a number of sites so that one single server houses as much as around 3000 to 5000 websites. In a shared web hosting environment, a single server is used to host many websites like stated above. If you purchase shared web hosting from Bluehost, usually you don’t get the “Remote Administrative Access” to your shared hosting server. Do you know why? This is because in a shared server there are many websites including web applications hosted. So the person who has access to server, has access to all the websites and they can easily manipulate or spam other websites and that’s why you don’t get full admin access to the server. #4. Does Bluehost offer any marketing or promotional offers and discounts? YP free listing in order to list your website on business listing sites like YP. #5. Is there any difference between both Bluehost.in Vs Bluehost.com? So what’s the primary difference between Bluehost.in Vs Bluehost.com and should you buy Bluehost India hosting or Bluehost.com hosting? We highly recommend you to go with Bluehost.com hosting as its data centres are located in multiple areas around the world and is maintained by experience people whereas Bluehost India is using Resellerclub to sell hosting and domain packages. Bluehost is known for its reliability and giving top notch support to its customers. So you are in safer hands if you are running your sites on Bluehost servers. I’ve been personally using Bluehost for several years now and I’m never disappointed with their services. If you are looking for a faster, better and efficient hosting, go for Bluehost. Not only it comes at a cheap price point but it also gives you excellent features such as anytime money back guarantee and a free domain name for 1 year. So what you think about this Bluehost shared hosting tutorial? Let me also know which Bluehost shared hosting plan you are going to pick.